Movement and music have been a part of my life since the age of 5 when I started training in ballet and playing the violin. At age 11 I followed my mother on one of her reporting assignments to the grand opening of the new big top for a youth circus in my hometown, Saint Paul, Minnesota. I fell in love with all I saw there. 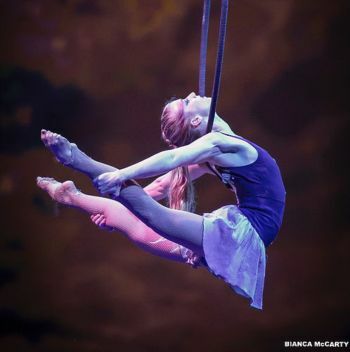 This lead me to train pre-professionally with Circus Juventus, study dance at Saint Paul Conservatory for Performing Artists as well as the University of Minnesota and move to Montreal in order to pursue professional training in aerial arts, contortion and dance.